Markib, which means “small boat” in Arabic, is the name of Younes Rahmoun’s exhibition at Espace Le cube in Rabat. 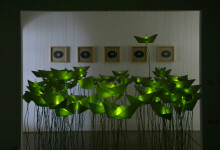 This exhibition brought together five drawings and an installation also entitled Markib, comprised of ninety-nine small boats made of tracing paper and each enclosing luminous green diodes. 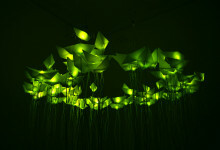 Suspended from the ceiling in a circle, the small boats formed a floating halo that illuminated the space with a green light. Two cables encased in plastic descended from each boat. They met on the flow where two other bare cables were placed in a circle, distributing electricity.